A debut album with all-original music. 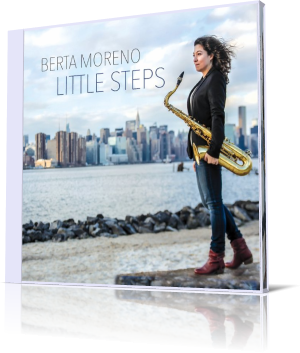 Add a couple of Grammy winners and nominees to the mix, and you have the stunning introduction to saxophonist Berta Moreno, Little Steps. Moreno plays tenor sax and composed all eight songs. Her accompanists are Steve Wilson, alto and soprano sax; Troy Roberts, tenor and soprano sax; Manuel Valera, piano; Maksim Perepelica, double bass; and David Hardy, drums. The set opens with the cool “J.G. Power.” The blended saxes carry the melody after the finger-snapping pace is set by the rhythm section. Moreno then goes on an extended jaunt, delivering with a happy-go-lucky attitude. The sax trio engages in a brief, but tightly syncopated series of rolls before the next soloist. The cool mood continues until the next round, when the sax cranks up the intensity. After another rolls in which the saxes call, with a response first by the drums and then by the bass, the song reverts to the main theme. “Cosmic Dance” is an easygoing piece. The saxes harmonize beautifully on the melody. Valera gets a moment to stretch out. Perpelica and Hardy have a sideshow going, as they mix things up throughout solos. Moreno was born in Madrid, Spain. Her first instrument was guitar, but she later adapted to clarinet. Her classical training behind her, Marino turned to jazz and the saxophone. She obtained a degree at the Conservatory of Madrid and later degrees in music teaching, and psychology and pedagogy for education. After a few years in Rotterdam, The Netherlands, Moreno migrated to New York City, where she continued her education and continued developing her voice on the sax.